The wrist and hand use many articulating joints to place our fingers into proper position. These motions enable everything from fine motion such as writing, to complex gripping and squeezing. Arthritis causes pain and stiffness making these activities difficult. Arthritis may be limited to a single joint or can affect multiple joints in the hand. Arthritis can progress over time causing increasing pain and stiffness–these limitations make activities of daily living more difficult. A normal joint consists of matching sets of articular cartilage surface. Cartilage is unique in that it does not have a direct blood supply to nourish the cartilage. 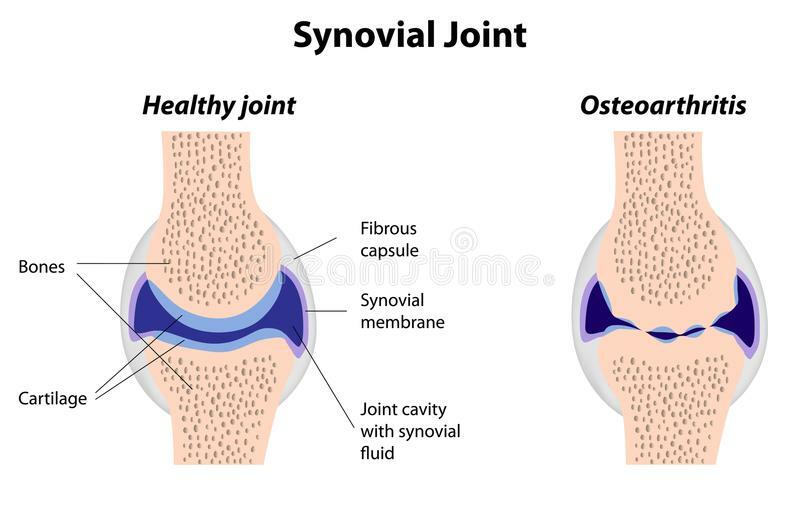 Instead, the lining of the joint, called the synovium, secretes synovial fluid which lubricates the joint and nourishes the cartilage. Arthritis therefore is an inflammation of the joint. A normal joint on the left—note the matching articular cartilage joints. On the right the osteoarthritis joint shows thinning of the cartilage along with incongruity of the joint. There are many forms of arthritis, but the two most common are osteoarthritis and rheumatoid arthritis. Both diseases affect the lining of the joint, causing the articular cartilage to thin and become less smooth. Healthy joints rely on cartilage for the lubrication needed to function. 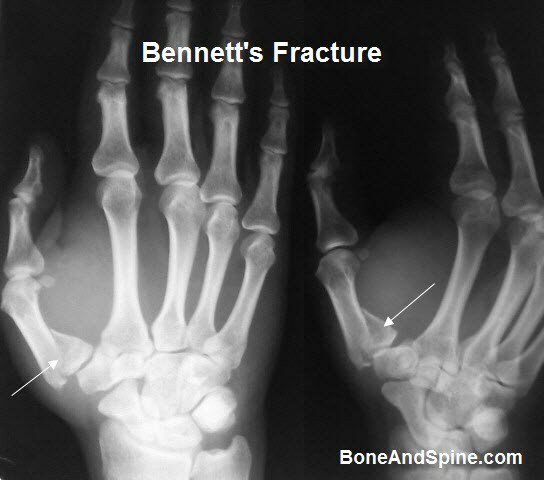 Deterioration of this structure causes catching, popping, stiffness, and pain. Osteoarthritis and Rheumatoid arthritis are the most common disease causes for arthritis. Both diseases are usually associated with gradual onset of symptoms, as the cartilage deteriorates. Osteoarthritis or degenerative arthritis typically affects patients as they age. 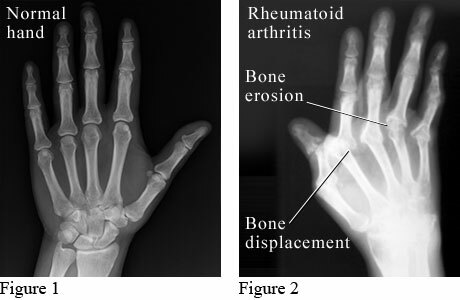 Rheumatoid arthritis is most commonly a systemic disease effecting multiple joints in the hand and body. There is more inflammation with this type of arthritis than in osteoarthritis and swelling of involved joints is more common. Uncommonly, single joint involvement may occur with this disease. Osteoarthritis also known as degenerative joint disease is more common. This disease typically affects all individuals as they age—but in different levels of severity. The disease causes thinning of the cartilage with less inflammation than rheumatoid arthritis. The joint may wear unevenly giving rise to popping, cracking, and locking. Injury to joints in any place in the body can cause irregularity of the joint surface (articular cartilage). Irregularity of the joint lining causes the joint to lose its smooth gliding surface and leads to post traumatic arthritis. 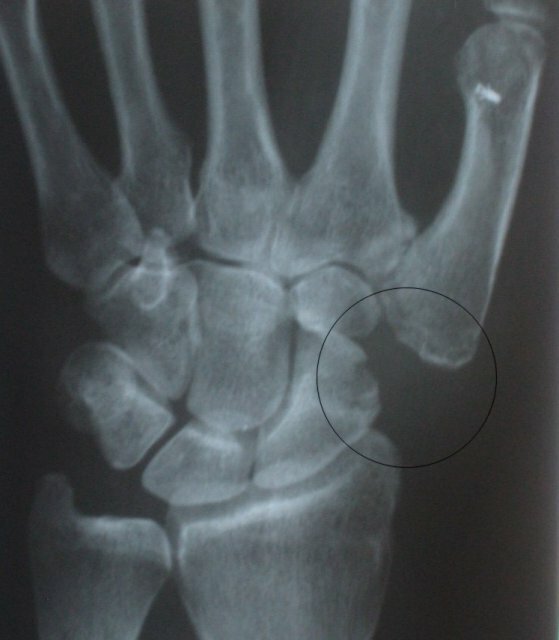 This x-ray shows a fracture of the base of the thumb joint with deformity which may lead to posttraumatic arthritis. The most constant symptom associated with any arthritis is pain. The pain associated with arthritis may be initially associated with heavy activity. Patients may repot cramping, aching or burning associated with the joint. Often the symptoms occur after the activity has ended and may persist. Many patients will complain of morning pain with osteoarthritis. The pain associated with arthritis typically progresses. Initial symptoms are then triggered with less activity and the pain becomes more constant. Stiffness of digits is another common complaint—although early in the disease morning stiffness is predominate. After your hand surgeon has reviewed your symptoms, the surgeon may inquire into your family history or related medical history. The surgeon will note the range of motion of joints. Along with motion—examination for crepitance or swelling is included. Any deformity of the joints is noted as some types of arthritis have a particular predilection and progression. Routine x-rays are helpful in determining the health of joints. Healthy joints have appropriate clear spaces between joints inhabited by healthy cartilage. As the cartilage is degraded, this amount of space is decreased and may be accompanied by the development of osteophytes. Laboratory studies are more helpful in the diagnosis of rheumatoid and inflammatory arthritis than in osteoarthritis. Your surgeon may include testing for rheumatoid factor or antinuclear antibodies. However, negative findings for these tests do not exclude inflammatory arthritis as there are seronegative patients with these diseases. Inflammatory arthritis is a clinical diagnosis and patients may require referral to a rheumatologist. Nonoperative Treatment options for arthritis of the hand and wrist include medication, splinting, and injections. Medications treat symptoms but cannot restore joint cartilage or reverse joint damage. The most common medications for arthritis are anti-inflammatories, which stop the body from producing chemicals that cause joint swelling and pain. Examples of anti-inflammatory drugs include medications such as naproxen and ibuprofen. Tylenol is not an anti-inflammatory agent, but is often prescribed for pain relief—particularly for patients who are intolerant of naproxen or ibuprofen. To date, there has not been convincing evidence of the ability to rebuild cartilage with dietary supplements. Dietary supplements may contain the building blocks for cartilage, but have not been shown to affect cartilage repair in humans. Splinting may be used in conjunction with other modalities. Typically these splints are utilized for activities which cause pain and are not utilized at rest. These splints may be custom made by a hand therapist or off the shelf braces provided by your hand surgeon. Proper brace fitting is important to obtain best results. If nonsurgical treatment fails to give relief, surgery is usually discussed. There are many surgical options. The joint involved, the age of the patient, and the functional desires of the patient are a few of the many considerations when selecting surgery. Joint fusion is the oldest treatment and a mainstay of current surgical practice. Joints which are fused do not move, but have improved stability and decreased pain. Fusion may be the treatment of choice for the terminal joints of the fingers and thumb. A joint fusion of the dip joint of the finger using a compression screw. The goal of joint replacement provides pain relief as well. However, joint replacement couples this pain relief with restoration of motion. 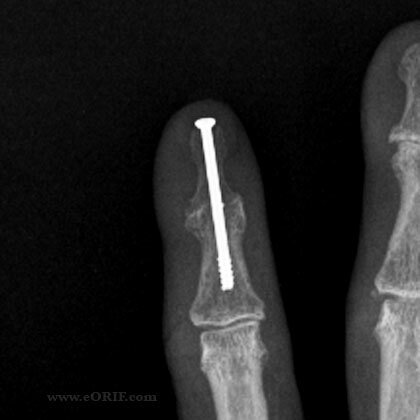 Hand surgeons replace joints both with metal and plastic as well as tendon. The best approach is customized for the patient and typically performed by a trained hand surgeon. The Trapezium has been resected and replaced by tendon for osteoarthritis of the base of the thumb. Most hand arthroplasty surgery can be completed as an outpatient surgery and the majority done under regional anesthesia. For most patients, blood loss is minimal and unless there are medical indications—prophylaxis for deep vein thrombosis is not necessary. Other risks of surgery are small and include infection, bone healing, tendon rupture, and stiffness. After surgery patients are instructed in elevation of the extremity and work on range of motion for the digits not affected. At two weeks most patients have suture removal and some are placed into a removable brace. By six weeks after surgery, most patients will have considerable healing and will likely start weaning from the splint. Work on range of motion can be accomplished at home or with the help of a hand surgeon. Strengthening of the hand, wrist, and arm are emphasized and most patients should gain good use of their wrist and hand—especially with diligent work on motion and strength. Modern hand surgery arthroplasty care has greatly improved the results for patients. Return to sports after surgery typically requires 3-6 months. Patients report continuing improvement for up to one year after injury.